Open your computer’s web browser program. Yes, these steps work best if you use your computer, not the tablet. Visit the main Google page. Click the Sign In link or button. Another page opens, and on it you can log in to your Google account, but you don’t have a Google account, so . . . The link is typically found below the text boxes where you would log in to your Google account. The link is titled Sign Up. To try things out, log off from Google and then log back in. That way, you ensure that you’ve done everything properly — and remembered your password. Your web browser may even prompt you to let it remember the password for you. You may want to create a bookmark for your account’s Google page. The Ctrl+D or Command+D keyboard shortcut is used to create a bookmark in just about any web browser. 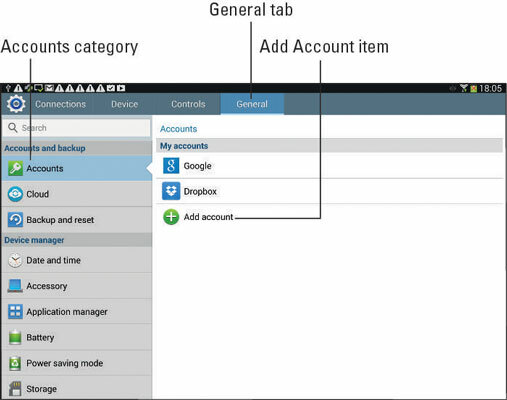 Your next step is to make your new Google account known to the tablet. Keep reading. The Apps icon is located on the Home screen. Its icon is shown in the margin. You may have to swipe the screen right or left to find the Settings app. After touching the Settings icon, the Settings screen appears. It contains commands for configuring and setting tablet options. Touch Add Account (next to the green plus sign). Select an account from the list that appears. Don’t worry if you don’t see the exact type of account you want to add. You may have to add an app before a specific account appears. Follow the directions on the screen to sign into your account. The steps that follow depend on the account. Generally speaking, you sign in using an existing username and password. When you’re done, press the Home key to return to the Home screen, or you can continue adding accounts by repeating these steps.